PLAY-OFF SPECIAL: Will Peterborough United reach Grant McCann’s end-of-season target? Will Posh boss Grant McCann be celebrating at the end of the season? Posh boss Grant McCann has set the bar high by declaring his team will need 75 points to qualify for the end-of-season play-offs in League One. That number would have sealed at least a sixth place finish in each of the past 15 seasons. 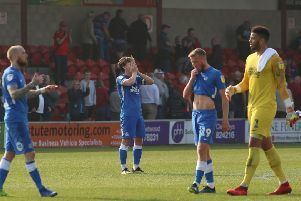 Chesterfield finished sixth with as few as 69 points two seasons ago. Posh midfielder Leo Da Silva Lopes could be a key player between now and the end of April. Huddersfield finished sixth with 80 points in 2009/10, but 74 would have been enough. To meet McCann’s target Posh need another 34 points from their remaining 19 matches. Posh could do with Marcus Maddison re-capturing his best form. Posh have a good recent record in this fixture. Vale have started to struggle. The Blades are going up. Saddlers are average this season. Posh to edge a tight game. This could be a big game between play-off contenders. Posh were battered at the New Den last season. Bantams struggle for goals, but they could edge this one. The Us are heading for mid-table obscurity. Spireites’ new manager boost will have receded by now. Posh have to beat the strugglers at home. Gills are tough to beat at home. The Addicks are set to improve in the second-half of the season. Fleetwood’are this season’s Burton Albion. Dons can’t be as good as they were at the ABAX. Rovers will have nothing to play for. I hope Posh don’t need anything on the final day, especially if Bolton still need some points.